COLORADO SPRINGS, Colo. (Reuters) - The October 28 explosion of an Orbital ATK Inc Antares rocket bound for the International Space Station was most likely caused by excessive wear of the bearings inside one of the rocket's GenCorp Inc engines, Orbital said on Tuesday, citing a nearly finished report. Ronald Grabe, Orbital's executive vice president and president of its flight systems group, told the annual Space Symposium conference the company would submit its final report in coming days to the Federal Aviation Administration, which has been overseeing the company-led accident investigation board. "Their conclusion is that the most probable cause is that there was excessive bearing wear in the turboprop of the main engine number one," Grabe told Reuters after a panel. He said the bearings in the engine had worn down to the point where they no longer preserved the separation between the rotating and stationary components in the engine. No comment was immediately available from officials with GenCorp's Aerojet Rocketdyne, which refurbishes Soviet-era NK-33 engines and resells them as AJ-26 motors for the Antares rockets. Orbital had already announced plans to shift to a different motor even before the accident. The report's conclusion means that Aerojet Rocketdyne could face financial consequences for the explosion, which destroyed an unmanned capsule loaded with more than 5,000 pounds of cargo for the International Space Station. 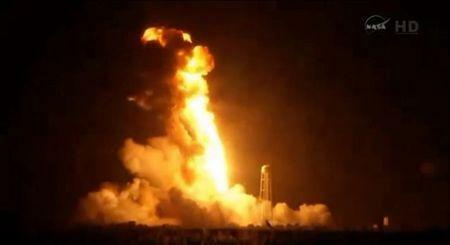 Orbital’s fifth Antares rocket launch ended 15 seconds after liftoff from Wallops Island, Virginia, on Oct. 28. Orbital in February had said there were more than half dozen credible causes of the explosion, including the possibility that debris from one of the fuel tank could have gotten into the engine. The accident investigation board included officials from the company, NASA and the FAA.